Here's my technique for making homemade toasted French oak staves for use in aging wines in 3- and 5-gallon carboys. It is updated from my initial efforts in late 2005. 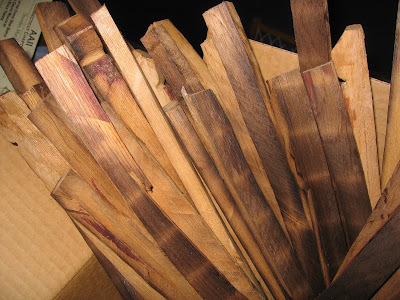 Start with stripped, bare strips of French oak, shaved from used barrels. Then, turn the oven to 425 degrees and set the timer for 5 minutes. The oven should reach temperature of 425 degrees at about 4 minutes and it will cook for another minute at that temperature. Smoke will be billowing out of the oven from about three minutes on. At five minutes, take the entire tray out of the oven (you may want to walk it outside) to stop it from smoking. Then turn each oak stave over to prepare to toast the other side. You can go to 6 minutes if you want a dark medium, and 7 minutes for charred oak. This is the first article I have seen for DIY Oaking. Could I just use american oak boards from the local lumber supplier? Those can be hazardous to your health depending upon the variety and what kinds of additives were included for construction use. Please use ONLY oak that was designed for aging wine. How 'bout taking oak firewood that's been air dried and splitting stave size pieces out of center then toasting?? Yes, untreated oak would seem appropriate. Interesting option. Have you tried any other local species of oak? I'm interested in coast live oak. That is an experiment I have not tried. PLEASE double check the status for whatever oak you wish to use - some oak is not appropriate for food and may be noxious or toxic.